I am a huge lover of the ocean. It's actually one of my favorite things about the state I live in. 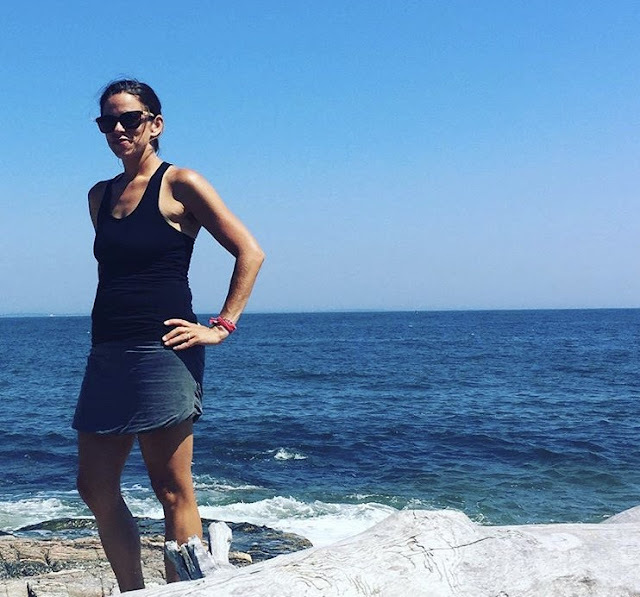 Before my family moved to Maine, we vacationed along the coast and that is where the love started. The rocky shores, beaches, so much to explore. Incredibly beautiful. Lucky for me, I married a man who shares the same love of the coast as I do. We love the water. It's our dream to one day (many years from now) retire somewhere along the water. 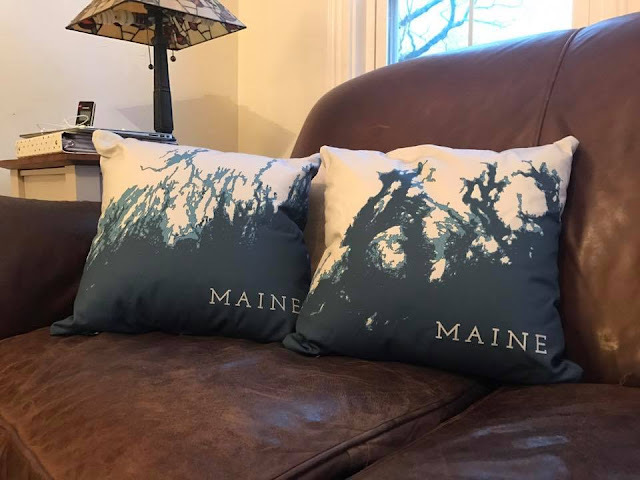 But until then, I'll continue to enjoy my trips to the beach and the rocky coast with my family and friends and then come home to enjoy my gorgeous new pillows and tote from a lovely lady, Anne Zimmerman, the owner and artist behind Coastline by Anne Zimmerman. I first saw Anne's products on my husband's Facebook feed and instantly fell in love. The shades of blue, the coast. It just drew me in and seemed perfect to me. Last month I took the plunge and purchased a set of pillows for my living room. Aren't they perfect? I think so! 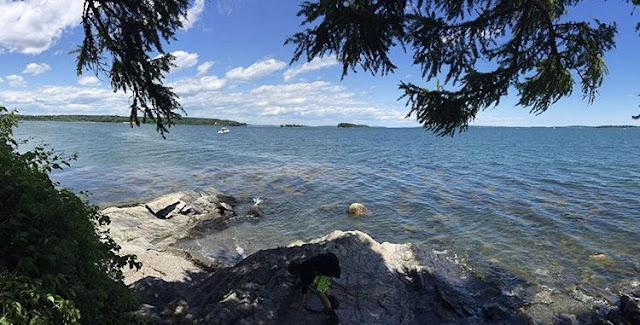 I chose a Downeast coastline and a MidCoast coastline. Perfect for my family with so many memories along both! Then Anne and I started talking a little bit. She actually went to high school with my husband and ran on the cross country team with him. It is seriously a small world indeed. Her products are absolutely gorgeous and would make the perfect gift for a friend, family member or yourself. You know you deserve to buy something pretty for yourself. So do it! 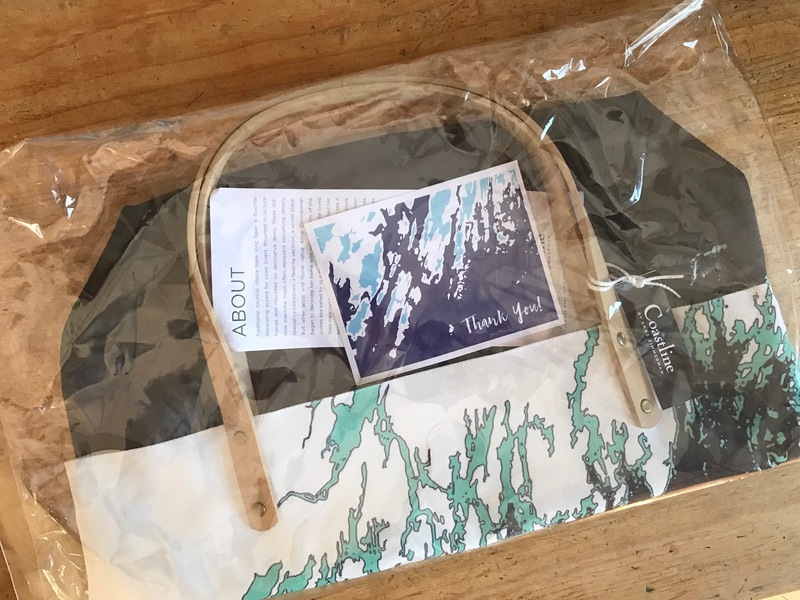 Anne just sent me one of her NEW Maine Coast Cruise Totes to review. As soon as I laid my eyes on it, I knew I was going to love it. The colors are very calming and draw you in. They make me want to go to the coast RIGHT NOW! But, alas, I live in Maine and we're heading into a super cold-spell, so for the time being you'll find me right by my wood stove until it gets a little warmer. I'm thinking it might be May before we get back to the coast. But until then, I have my Maine Coast Cruise Tote to remind me of the place I love the most. And I'll dream about hanging out on the beach again. The construction of the tote is quite sturdy. It will definitely hold up to everyday use. I see myself using it for just about anything and everything. When going out for a day trip and I want to bring along a book and snacks, I can see myself grabbing my new tote and taking it along. It will also be great for a quick trip to the gym. Plenty big enough for some sneakers and a change of clothing. Imagine all of the possibilities! And because I don't LOVE my current purse/handbag, I might just move into my new tote! It's THAT gorgeous! 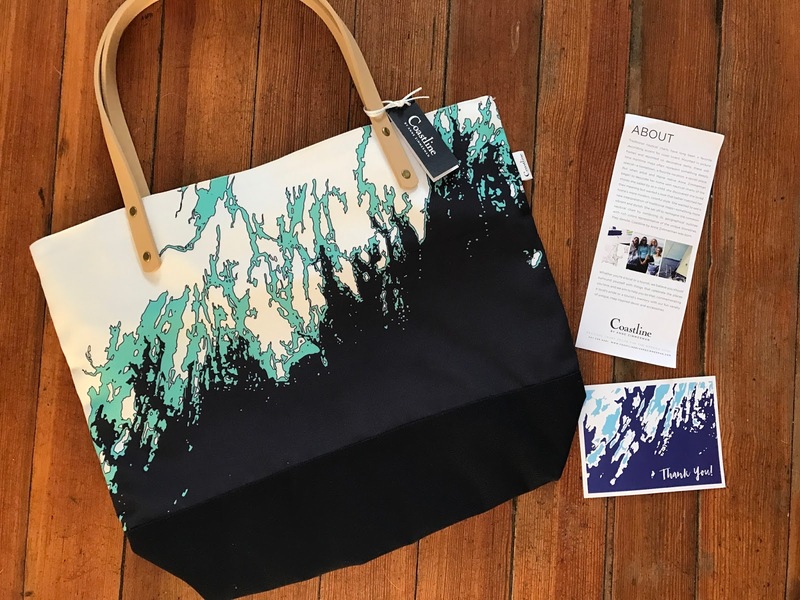 I've been going on and on about the Coastline Maine Coast Cruise Tote, but I need to add that Anne NOW lives in Florida and has an entire Florida line as well. You know, after our trip to Florida in April, I may need something from Florida! Her prints sure are pretty! And if you don't have any connections to Maine or Florida, do not worry! She has a New York Harbor line AND she makes custom pillows and wall prints. Your location, your colors. You know, I'm all about custom! And yes, I did mention something about a giveaway! Anne has a giveaway going on RIGHT NOW on Facebook. 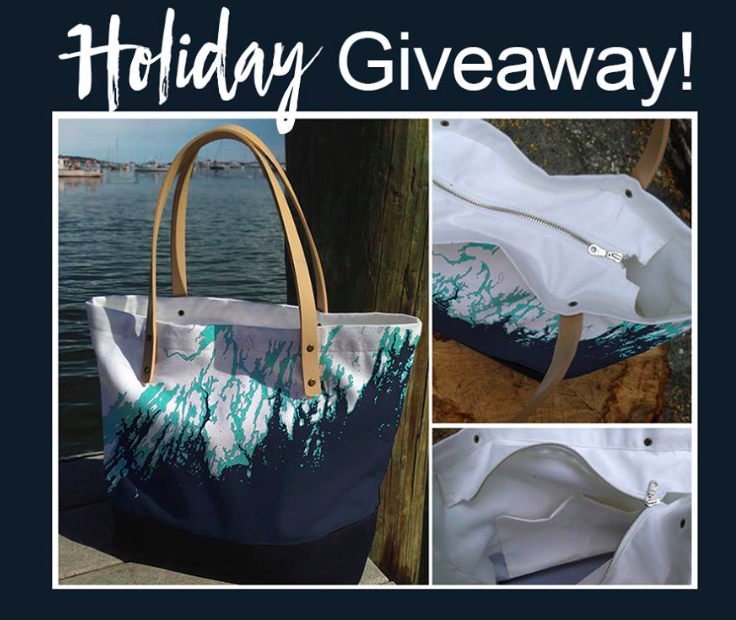 To enter, head over to the Coastline by Anne Zimmerman Facebook page. To enter, all you need to do is share the photo of the contest, then GO BACK to the original post on her page and comment "DONE". She'll select her winner from there. That is SO exciting and you'll love it! Check out Anne's website and let me know what you love about her products! Check it out and subscribe to her newsletter and you'll get a 20% off code. disclosure: I was sent a product as part of a review. I was not required to give a positive review. As always, all opinions expressed on my blog are 100% my own. Let StitchFix Style For YOU!